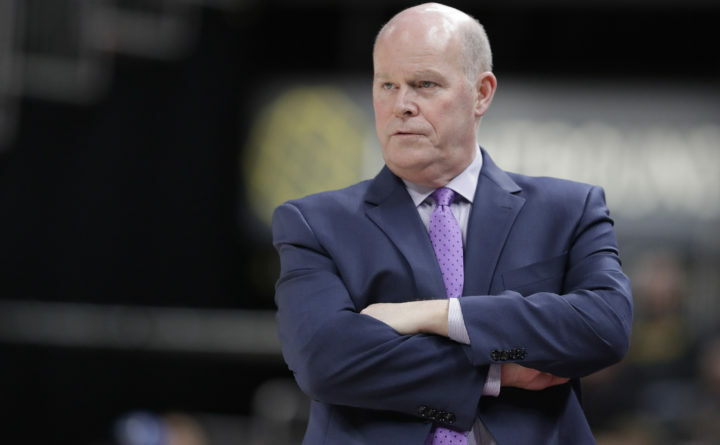 Charlotte Hornets coach Steve Clifford watches during the second half of the team's NBA basketball game against the Indiana Pacers, Tuesday, April 10, 2018, in Indianapolis. Clifford was born in Island Falls and grew up in Mattawamkeag until the third grade when he moved with his family to Vermont, where he went on to play basketball under his father, Gerald, at North Country Union High School in Derby Line, Vermont. Clifford then returned to Maine to attend the University of Maine at Farmington, where he played basketball for four years under longtime coach Len MacPhee. A guard, Clifford was named the Beavers’ best defensive player each of his last two years and was a team captain during the 1982-83 season. He graduated in 1983 with a degree in special education. Clifford then moved to the college ranks, initially as a volunteer assistant at Saint Anselm College in Manchester, New Hampshire, under head coach Bob Brown — the father of current Philadelphia 76ers head coach Brett Brown. He eventually became a paid assistant at the Division II school and remained at Saint Anselm for four years before moving to Division I Fairfield (Conn.) University in 1989. After a year with the Stags, Clifford rejoined Brown at Boston University. Clifford spent four years at BU, then went to Siena College in upstate New York in 1994 for a year before accepting the head coaching job at Adelphi University on Long Island where he led the Panthers to four straight 20-win seasons and four appearances in the NCAA Division II tournament while becoming the first coach in school history to record consecutive 20-plus win campaigns. That led to a return to the Division I ranks as an assistant at East Carolina, but for just one year before he moved on to the NBA in 2000, initially with the New York Knicks under coach Jeff Van Gundy, whom Clifford had met several years earlier at a basketball camp. Clifford spent one year as an advance scout and two more years as an assistant coach with the Knicks before going with Van Gundy to Houston from 2003 to 2007. Clifford went on to coach under Van Gundy’s brother, Stan Van Gundy, for five years in Orlando and then spent the 2012-13 season as an assistant with the Los Angeles Lakers before being hired as Charlotte’s head coach on May 29, 2013. Clifford on Wednesday called this a “disappointing” season because he felt this was his most talented Hornets team. It was a rough season for him in other ways — he missed 21 games because of headaches stemming from sleep deprivation. He acknowledged that the Hornets “didn’t make good progress” this year, particularly on defense, his forte. “The NBA isn’t about winning, the NBA is about winning in the playoffs,” Clifford said Wednesday when asked about his job security. “So if you want to look back at our five years, and I told our staff this last night, I do feel very good about where we are and how we are perceived versus where it was five years ago. But Clifford went on to say that isn’t enough.